I recently gave a talk about food at the local running club and, naturally, the discussion veered towards protein. This happens because people associate it directly to muscle. Really, that’s just the tip of the iceberg where protein facts are concerned. Bones & teeth: yes, they need calcium, phosphorous, fluorine and magnesium to give your body solidity, but those minerals are encrusted on a protein matrix, like a heavily beaded bodysuit. Protein does indeed provide energy (calories), but because it’s required for so many specific jobs in the body, it’s more practical to rely on carbohydrates & fat for most of your energy needs. The extra energy boost you feel from protein has more to do with the functional molecules that do the physiological work and keep communication flowing. Enzymes: facilitate just about every chemical reaction – and there are millions. The body recycles and reuses amino acids (the units that link to form protein) in whatever combination is needed at a given time. Because of that sustainable quality, protein has the lowest requirement of all the macronutrients – only 10-15% of caloric intake, as compared to 65% & 25%, more or less, for carbohydrates and fat. NUMBERS ARE GREAT, BUT HOW DOES THAT TRANSLATE INTO FOOD? It’s not as difficult as we seem to think. First, a reality check: the average American eats 100 g of protein daily. Much more than enough; an amount that sets us up for problems(I’ll get to that in a sec). Let’s look at the true needs of our example from above: a 140 lb woman. When you don’t eat enough protein, you lose body mass: hair, nails, skin, then muscle starts to break down; wounds don’t heal well and you get sick more easily; you become lethargic, and in the extreme your blood will degenerate. In fact, any of those signs could be a red flag that you need more protein in your diet. Continuing the analogy of the temple from Part I, when you don’t replace damaged bricks, nor maintain the mortar, the structure will eventually crumble. Necessary tasks will remain undone when you spread the staff too thin. 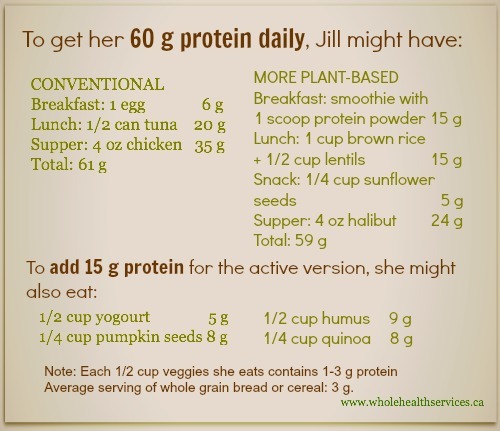 The other day, I heard someone at book club announce, “You could never get enough protein.” Why, oh why do we hold onto the idea that if some is good, more must be better? Eating too much protein doesn’t come without a price on your health. As a reflection of the consumer society in which we live, a high percentage of protein in the diet creates issues similar to the overcrowded landfills and plastic islands in the ocean. Dehydrates the body: water is necessary to the reaction that breaks peptide chains (strings of amino acids) apart. Increases tissue acidity, the playground of inflammation and feeding trough for cancer. Calcium & other vital minerals are drawn out of your bones to buffer the acid. To make up for a relatively low intake of carbohydrates, amino acids are converted to glucose for energy, an inefficient conversion that requires energy to perform. Force the kidneys work harder to eliminate the wastes, potentially allowing them to back up in a toxic traffic jam. All this extra peeing is how protein has become the latest panacea in our eternal quest for weight loss solutions: That big initial weight drop is nothing more than water loss. ARE YOU ABLE TO TAKE IT ALL IN? So you eat adequate protein for your age, gender, activity level (see the box above), yet how much of it are you absorbing? Before the protein-digesting enzymes can do their job, a protein needs to be denatured (uncoiled) by stomach acid. Not enough acid, and that protein stays pretty much intact through the rest of the digestive ride, leading to putrefaction. Hope this helps clear up some of the confusion. If you have any questions, bring them to the comments at the bottom of this page, so everyone can benefit. When you share your thoughts, you open the possibilities for others. 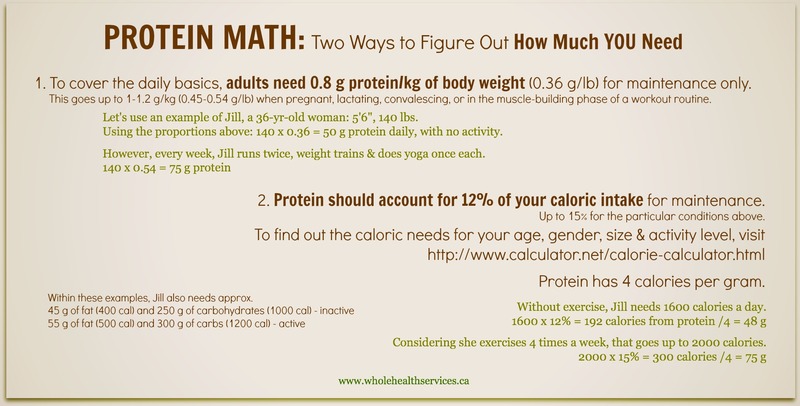 Be sure to share these protein facts with all your healthy-food-rules concsious friends using any (or all!) of the pretty green buttons. It’s that time of year in the northern hemisphere: the beginning of flu season. It had been my intention to share nutritional ways to support your organism from whichever viruses are floating around this year. Instead, I wonder, have you ever taken the time to consider the holistic significance of your immune system and how it works to keep you healthy? The immune system (IS) is your body’s defense against disease; no news here. But did you know it’s in fact one part of the complex messaging system in your body that includes your mind and emotions? The field of psychoneuroimmunology has broken open the mysteries of how hormones, neurotransmitters and the various immune responses work constantly to keep you healthy on a minute-to-minute basis. On its own, the basic function of the IS is to differentiate between self & non-self. Let’s take a step back and look at that role metaphorically. Differentiating self from non-self: what’s yours and what’s not. From a psychological viewpoint, that’s called boundaries. A healthy immune system is all about having healthy boundaries. Immunity is about not letting something in, or not letting it affect you. Like that saying, “I am immune to his charms,” meaning the guy has no sway with you. Again, from a physiological POV, the 1st line of defense is the skin and mucous membranes: the actual physical barrier that protects you from your environment. The skin also delineates the human form, it literally defines your (physical) edges. I don’t know about you, but when I’m out of sorts emotionally, I feel as if “I don’t know where my edges are”. I trip or bump into things, and I have a hard time making decisions that are right for me. At times like this, I’ve been taken advantage of, or I let someone else’s priorities rule my mind. You work long hours and barely have time for your family, let alone yourself, because you’re afraid there won’t be enough money to pay the bills. You say yes when the boss asks you to work over the weekend because it’s nearly salary review time; you have to say no to your daughter’s big soccer game. Your pre-teen really wants to go to a party weekend that you feel is wrong for his age. You tell him no, out of a desire to maintain his best interests and your values. He rants & screams all sorts of threats and insults, bangs his door. Do you maintain your decision. Or, do you worry that his frantic behaviour is an indication that he’ll act in some rash way, so you give in. You need time to yourself this weekend, to recharge your personal batteries. You look forward to puttering in the garden and curling up with a good bodice-ripper. But your sweetie is counting on you to go to the family gathering at his mother’s cottage. You go out of obligation, or stand your ground and feel guilty all weekend. These types of scenarios send messages to your mind & body that your values, needs and priorities are secondary to everyone else around you. Keep this up, and eventually lose sight of what’s yours and what’s not. Physically, that’s what your IS does. It lets in and/or defends against organisms seeking access to, and energy from, your body. Because of its strong ties to your thoughts and emotions, its actions can happen as a response to love or of fear. Now, let’s go a bit deeper. OK, a lot deeper. When I talk about the (capital S) Self, I’m referring to your Higher Self, your Spirit. The part that connects you to the Cosmic Whole, that carries the blueprint for who You are. As a messenger within your organism, the IS is a part of the Soul’s guidance system. Your soul is kind of like the GPS that helps you navigate your Spirit’s map. The Soul leads your body, heart and mind towards the greatest expression of your Self. On an energetic level, the IS helps you grow into that full expression, by acting as a messenger that determines what is true to You and what isn’t. When you prevent that growth, by suppressing immune responses (such as acute fever & inflammation), the IS cannot convey its messages effectively. The message needs to get louder to be heard. The diminished IS comes from a lack of self-care (read: Self-Love). The hypersensitive responses are an over-reaction born from Fear. When we eat chicken soup for our illnesses, how much of the immune-boosting of the soup comes from the Love of the mother or grandmother who made it? Several studies at Linda Loma University in California document the direct impact of sugar on the IS. (Google it for details.) Large amounts of sugar – an addiction used to replace any lack of sweetness or love in our lives – brings with it a false sense of well-being that simply over-excites you, then leaves you drained and wanting more. Kind of like a bad boyfriend. Physiologically, the adrenals feel the brunt of that impact. The adrenals play a key role in our response to stress (they’re the source of adrenaline & cortisol). Did you know they’re also responsible for modulating inflammation – one of the non-specific immune responses? If they’re not happy, then neither is your ability to respond to invaders. The adrenals are a part of the 3rd Chakra, the Will. This emotional energy centre oversees your ability to take your place, to stand your ground. It’s the home of your sense of Self. It’s depleted by fear and enhanced by self-love. Poor adrenal health is something I deal with almost constantly in my practice. As women we live our lives from our should’s, from the needs of others and out of fear of losing them. No matter what type of issue she comes to me with, there’s often a piece that leads right back to a woman’s 3rd chakra and her adrenals. As you prepare for the winter, check in on how solid you’re feeling on a mental-emotional level. Do I live my life according to what’s true for me? Do I honour my own values? Am I able to say No when something’s not right for me? Do I say Yes when something is? Do I have a good support system? In 2 of her books, Dr. Christiane Northrup points out that simply having the perception of strong emotional support enhances a woman’s immune response. One last reminder: A healthy body and immune system does not necessarily mean that you’ll never get sick – it means that if you do, you’re equipped to deal with it. What will you do to improve your sense of Self before hunkering down for the winter? Share your thoughts with the rest of us in the comments below – you might provide inspiration and support to someone else! I wish you a winter filled with rosy cheeks and laughter!